Sujata Massey at The Poisoned Pen! There's nothing like reading your first "Best Read of 2018" book one day and then going to your favorite bookstore (The Poisoned Pen in Scottsdale) to see its author the very next day. That's exactly what I did January 8, arriving in plenty of time to buy some books, reserve my seat, and then sit in the back to read. Once people began to arrive and I went to take my seat, I learned that those sitting around me wanted to talk books, and I joined in happily. 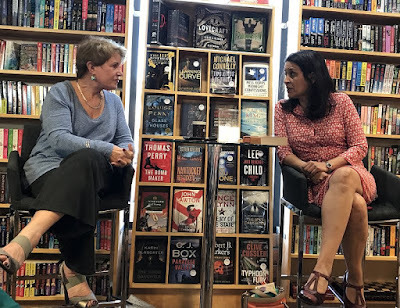 When host Barbara Peters brought Sujata Massey to the front of the room, I was all set to find out more about the author and her latest book. Sujata Massey is known for her Rei Shimura mysteries set in Japan. The series begins with The Salaryman's Wife which won the Agatha Award for Best First Novel. Barbara asked Sujata, "Why Japan?" "It was the early 1990s, I was a newlywed whose husband was a Navy doctor. We lived in Japan for a couple of years," Sujata told us, "and it turned into one of the best things that have happened to me. Before my marriage, I used to work with Laura Lippman, if any of you know who she is?" [Many nods in the audience] "For those two years in Japan, I studied cooking, the Japanese language, and I taught English. I wanted to share my experiences, so writing the Rei Shimura books was my way of making lemonade from having to follow my husband around from post to post." Barbara mentioned that the series came to an abrupt halt, and Sujata nodded. "Yes, the publisher didn't want another Rei Shimura after book number nine [Girl in a Box], so the next book was published by Severn House, and the last I self-published. "I decided that I wanted to do something different. I was born in the UK, and I'm half Indian and half German. I'd stopped going to Japan every year for research, and I'd started going to India. My husband and I adopted our two babies from India. 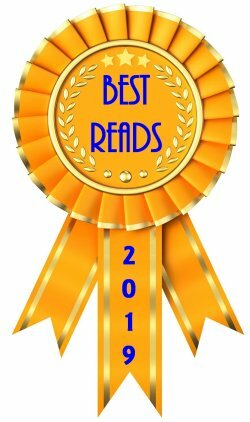 Two of my favorite non-mystery authors are Lisa See and Amy Tan. I love their stories about family, especially women and children. So I wrote a book called The Sleeping Dictionary. It took me a long time to write. 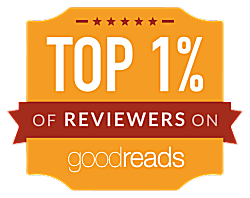 It was difficult to get reviews for. Literary fiction is hard to sell." When Massey mentioned that the first book she'd ever read that was set in India was Frances Hodgson Burnett's A Little Princess, I had to smile. I think it was mine, too. 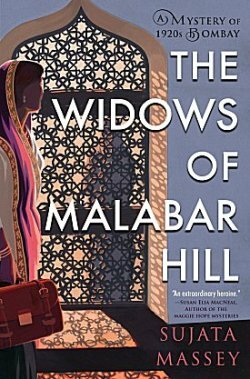 Now talk began to turn to Sujata's first book in her new series, The Widows of Malabar Hill. 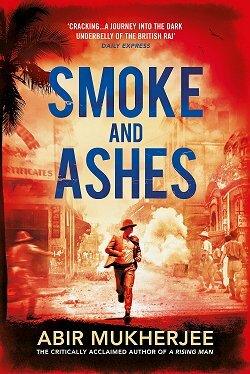 The book begins in the early 1920s in Bombay, India. The British Raj is still there, but there's a strong movement for independence. World War I has also had an effect on the country. "My main character, Perveen, comes from a Parsi family-- do any of you know about the Parsis?" Sujata asked. "The Parsis are a minority in India now; there are only about 50,000 of them in the country. They came from Persia beginning in 700 AD and focused on agriculture and building boats. Bombay was a Portuguese colony that the British got hold of, and since the British liked the Parsis, they used them to build up Bombay." 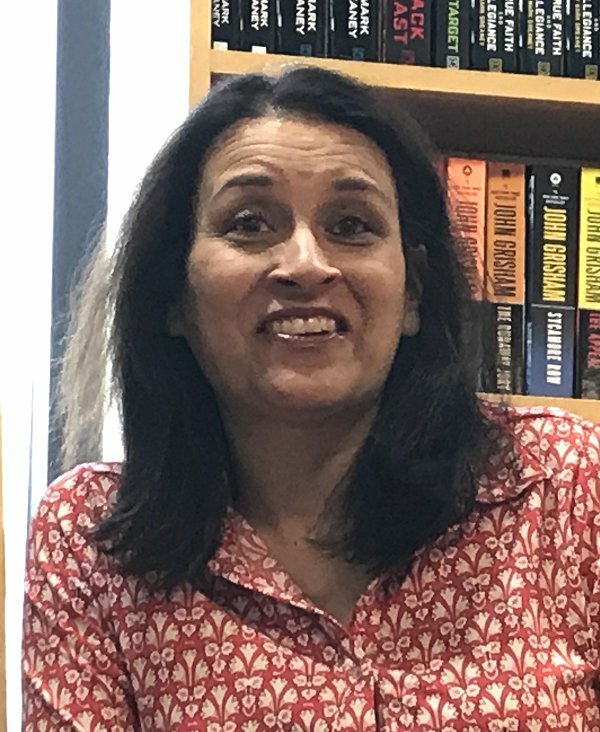 Barbara, having been a lawyer, wanted Sujata to share the background on her character, Perveen Mistry. 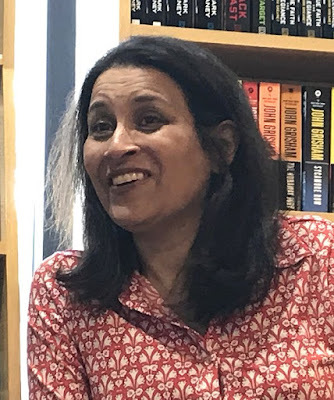 "Yes," Sujata said, "Perveen is the first woman to practice law in Bombay, and she is based on Cornelia Sorabji, the first woman to practice law in India. Sorabji studied law at the University of Bombay but was not given her diploma because she was a woman. Then people like Florence Nightingale raised money so that she could attend Oxford. Sorabji was the first female graduate of Bombay University to be admitted to the Allahabad High Court. She became the first woman to read law at Oxford University, and the first Indian to study at any British University." "Do any of you know what Perveen's last name-- Mistry-- means?" Sujata asked us. "It means 'builder.' Each of the major religious groups in India have different laws, and Perveen has to learn all of them. At that time, one third of all lawyers in India were Parsis because they were thought to be fair. "Something I loved while writing this book was discovering that many of the things I dreamed up about Bombay actually exist. A lot of the places in the book are real. I have a section on my website about this...."
"And you can check out the maps in the book," Barbara interjected. "Yes, I love how those maps turned out," Sujata said. "The bakery is real, by the way!" "Are you working on anything new?" Barbara asked. 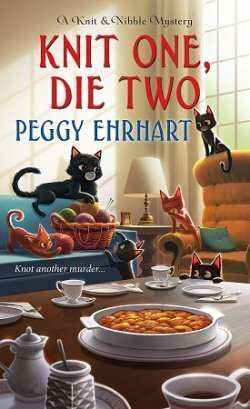 "I'm currently working on the second book in this series. In it, Perveen travels into the jungle to visit a princely kingdom. The little boy who will be the next maharajah there is at the center of a controversy. People are arguing over where he should be sent to school. Many want his education to help him get along with the British yet not turn his back on his own people. Others disagree." Sujata went on to tell us that, although Great Britain had overall control of India, there were still many kingdoms ruled by insanely wealthy maharajahs. 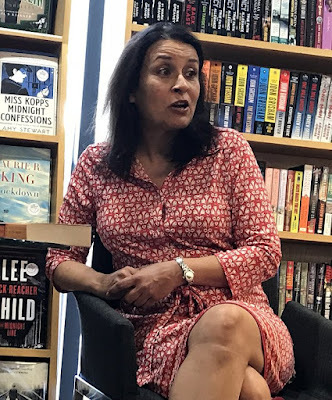 "I was shocked to learn that during the time period when my book takes place, many people died of alcoholism in India," Sujata said. "I think it was a case of too much money and not enough to do. There was also a lot of infidelity-- which is good for fiction!" "Do any of you know how the British got their toehold in India?" Barbara asked. No one did. "Charles II's bride, Catherine of Braganza, was Portuguese, and part of her dowry was the district of Goa in India. So that's how the British found their way into the country." "Bombay-- Mumbai-- is one of the easiest cities to get around in in India," Sujata told us. "They have preserved much of their history, and many of their historic buildings still stand. Also, you can walk around and not be harrassed by people begging or wanting to sell you things." Throughout this event, Barbara had been suggesting more books to read that are set in India. Books like the wonderful mystery series written by Tarquin Hall with titles like The Case of the Deadly Butter Chicken and The Delhi Detective's Handbook (which happened to be resting comfortably in my tote bag and is now sold out) as well as Shona Patel's Teatime for the Firefly and Flame Tree Road. Everyone, including Sujata, was taking note of the titles, and Sujata looked at Barbara and said, "You're the book whisperer!" That's one of the things I love about The Poisoned Pen. Everyone who works there is a book whisperer, and Barbara is the empress of them all. It's one reason why it's almost impossible to leave the building without buying something! My favorite bookstore is now doing podcasts, and if you'd like to hear this event, go to their podcast page and click on Sujata's photo. It's the next best thing to being there. Me, leave without buying a book or two? Ha! Wonderful! I'm so glad you got to go to that event and that you shared it with us. I'm looking forward to hearing Sujata on a panel (hopefully, she'll be on one) at Malice. I remember reading a book or two in that series set in Japan. And I love Tarquin Hall's books. 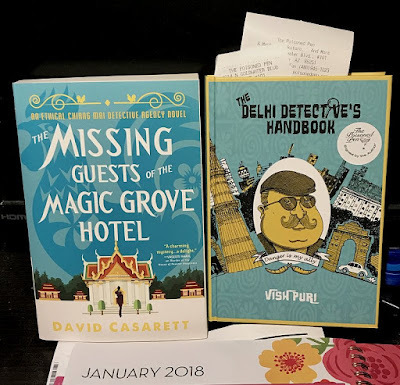 I miss Vish Puri, so I had to get my hands on his detective handbook! Great write-up and I'm so glad to hear Poisoned Pen is doing podcasts. And I will read that book. I have read two of Kishwar Desai's books set in India. Witness the Night is harrowing, but good. The second one is rather witty about the serious topic of surrogacy. Also, I read one of Tarquin Hall's book and one about Inspector Chopra inheriting a baby elephant -- adorable. I will read Sujata Massey's new book. It's on library hold. Vaseem Khan's Inspector Chopra mysteries get better with each new book. I really enjoyed his latest, in which I learned a great deal about India's movie industry. What a fun event! I am nearing the end of the book right now! I have also read one of Tarquin Hall's books about Inspector Chopra. And glad to hear we will see more of Perveen.